Are you going to do ACTUAL voices or just Microsoft Sam voices. 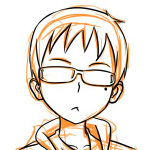 Cause if you are doing ACTUAL voices, I could voice Hisao or Kenji. There will be no voices. The ones on the blog are only an April Fool's joke. I know some girls, myself included, who would be more than happy to provide voices free of charge for this project. We have one our guy friends call "Moe Shoujo" because she talks like a little Japanese schoolgirl. It's adorable! Seriously, if it's at all possible to put voices in--maybe not full voices, but at least plot points and/or introductions, it should be done. We are not actively seeking voicing solutions because the quality we require for voicing is pretty high (out of league for most), and organizing voicing a game this large is not trivial. The bang for buck is just not high enough. Well, I did say free, so I dunno what you mean by bang for the buck. Is there at least going to be a theme song? You should have an adorable song, at least. It won't feel moe without it. If it's that difficult to add tiny bits of quality voice acting (which, as a hobbyist programmer I know isn't hard to do, depending on your design engine), fine. But if you have the opportunity, couldn't you add a bit? Obviously, Shizune couldn't have a voice as a mute, but that would then draw more attention. Effectively, by not adding vocals, you make everyone mute. You leave it to the imagination of the player and, while that's not necessarily always a bad thing, in this case it takes away from the potential for storytelling. Perhaps the easiest solution would be to find someone not currently involved with development to specifically coordinate tryouts in a tentative first step? This would prevent the current team from being overwhelmed or devoting massive amounts of time to listening to auditions. I'm sure someone could be brought up to speed as to what the developers were looking for fairly quickly. If that person conducted public tryouts and pared the possibilities to a few individuals for each role, the developers could retain control while cutting down on the workload required for a significant gain in game experience. Given the vast number of people that would be willing to do this work for free either as work experience or just out of devotion to the concept, it seems a shame to miss the opportunity. As we knew there's stigma and complain for the lack of quality in dubbing of film/anime translations, and those voice actors/actresses are paid professional voice actors (probably). > Given the vast number of people that would be willing to do this work for free either as work experience or just out of devotion to the concept, it seems a shame to miss the opportunity. The birth of KS around 2006 are also swarmed by vast number of people that would be willing to do work. In the end it's filtered to people who doesn't easily lose the original motivation and interest, to around 10 dev members who are still working for this up until now. The staff roster is currently stable, and to accept more people (voicing would probably need 10 people or more, every cast we have) is risk we can't afford. I know that this question has been answered before, but I'll state a few things here. Firstly, as much as I would like to voice a Visual Novel, Katawa Shoujo is far too big of a project to do this on at this time. Of the samples I've listened to, not a single one has managed to get the characterisation right. To record something of this magnitude to any acceptable quality you would need access to a Vocal booth and associated equipment, a talented cast led by an even more talented director, about 3-4 weeks of rehersal and at least the same in full-time recording. Having worked in a vocal booth studio before I can safely say that this is hard work. As a result, there will be no offical voice track for Katawa Shoujo. If you and your friends want to create a voice track then I can't stop you, but we will not sanction it. If you would like to continue using this thread to orgnanise fan-driven voice tracks, then by all mean do so, but be aware that the devs will more than likely not participate. Sorry, didn't mean to imply it hadn't been considered or there was minimal effort involved, just proposing a potential solution. Note that I didn't say I wanted to be the person doing it. Chiming in here as a pro voice actor who has done numerous works online. When I first played, I thought how great it would be to voice a project like this. And honestly, I still think it would be pretty great. But with the length of the demo alone, that's quite a few hours of recording there already. And even if everyone has a professional quality mic, each studio setup is a little different, so it'll still sound a little bit different. I think having a voiced game is a wonderful idea, and I would definitely be first in line to audition - but with the current situation, maintaining the quality of the recordings (and even keeping all the cast together - I've seen too many failed projects where cast members just disappeared) seems unfeasible. Maybe a drama CD, then? Well, not a CD, but some kind of scripting at least? Actually, I don't mind if there's no voicing. It lets me imagine what I believe how the characters should sound like.